I am a SUPER HOST! That means I have all 5-star ratings with excellent service provided! This Historical Home was built in the early 1900's. Totally renovated, with all the charm of New Orleans. Our New Orleans Creole cottage home is very spacious with new furniture and all the making of a comfortable home. The Historical Bywater neighborhood is an artsy area with easy access to the French Quarter, Frenchman St, Crescent Park, cafes, restaurants, grocery, park, and bars all within walking distance. Welcome, and enjoy our Historic Bywater neighborhood. ( 15 -20-minute walk), but still far enough to not have the noise, expensive parking and activity of the French Quarter. The Gabrielle Grace Manor has a Living room with hardwood floors, TV, sofa and 2 chairs, WiFi, cable TV. The kitchen is fully furnished, (but who wants to cook when you're in New Orleans and you have all this good food). 1st. bedroom has a new queen bed and mattress and hardwood floors and TV. 2nd. bedroom has a new queen bed and mattress and hardwood floors. 1 Bathroom consists of a toilet and combination tub/shower. Just remodeled in the last year. 2nd bathroom consist of a toilet and shower. Great Location.... New Orleans ranked 2nd best U.S. city by Travel + Leisure in 2015, 2016 and 2017. Travel + Leisure attributes New Orleans' rise in the rankings to a growing number of new hotels, shops, and restaurants across the city as well as the thriving Faubourg Marigny and Bywater neighborhoods. Our home is a vacation rental for a nice place to stay while you are in our home. We do not allow any parties, receptions, functions, and anything in that order. Sorry, but we are in a Historical Neighborhood, and we must respect our neighbors. We own and manage The Gabrielle Grace Manor and three other rentals. We are from the outskirts of New Orleans known as St. Bernard Parish, only minutes away from the French Quarter. Our families were fishermen and farmers. We grew up on the bayou where we learned to live off the land. We also had a Seafood Business where we sold and shipped shrimp, crabs, oysters, and fish, mostly to New Orleans and Baltimore. Our families and us all share the love for our beautiful city "New Orleans". We love the Bywater area it's a great laid back artsy neighborhood. One stay here and you will be in love too. Our house is over 100 yrs old. Once inside you will see the beauty. So book now and come on in! BYWATER HISTORIC HIPSTER NEIGHBORHOOD ONLY 1 MILE TO THE FRENCH QUARTER Wouldn't you love to visit New Orleans and stay in the Bywater Historic Hipster Neighborhood and walk to Bacchanal Wine, The Famous Elizabeths Restaurant, Pizza Delicious, Parleaux Beer Lab Craft Brewery & Taproom, Vaughan’s Bar, Stroll down Crescent Park, the Joint for some of the best Bar BQ, Bywater Bakery, Bywater American Bistro, Fradys , or Frenchmen Street and listen to some Jazz or Blues music and so much more? Oh yeah, don’t forget to make time for Bourbon Street and the French Quarter. If this sounds like you book your next vacation with Best New Orleans Vacation Rentals Fodor’s names Bywater a top travel destination in 2019 The neighborhood is “full of cultural surprises,” according to its writeup. By Missy Wilkinson@missy_wilkinson Nov 16, 2018, 11:42am CSTSHARE On Fodor’s list of 52 inspiring travel destinations for 2019, New Orleans’ Bywater neighborhood is No. 24, falling between Hawaii and Trinidad and Tobago. It joins international locales including Berlin, Detroit, Morocco’s Atlantic Coast, and Japan’s Setouchi Region. We choose our property in the Bywater for its beauty, style and also in a short walking, bicycling and driving distance to the French Quarter. We have a lovely tropical courtyard with a BarBQ Pit and table chairs that you will love to drink your morning coffee or your afternoon cocktail. 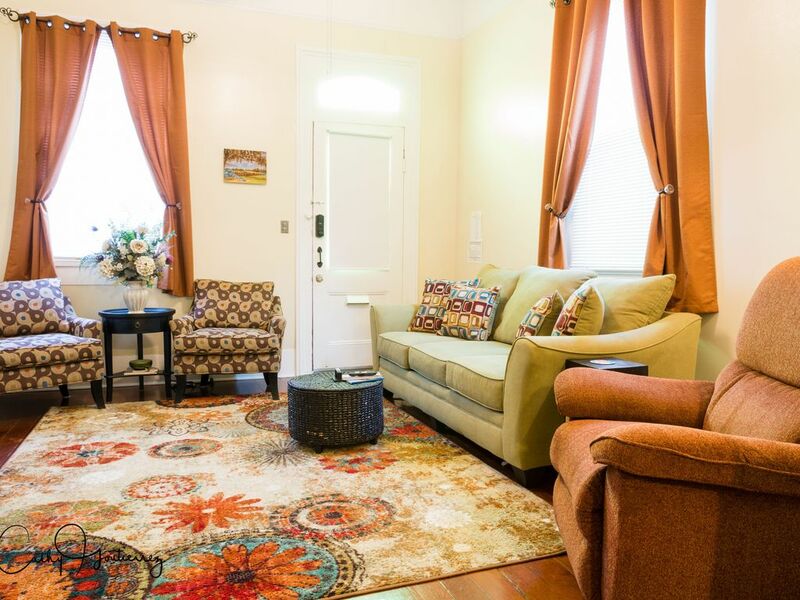 To stay in our residents you will truly experience staying in an authentic New Orleans home. BYWATER HISTORIC HIPSTER NEIGHBORHOOD ONLY 1 MILE TO THE FRENCH QUARTER Wouldn't you love to visit New Orleans and stay in the Bywater Historic Hipster Neighborhood and walk to Bacchanal Wine, The Famous Elizabeths Restaurant, Pizza Delicious, Parleaux Beer Lab Craft Brewery & Taproom, Vaughan’s Bar, Stroll down Crescent Park, the Joint for some of the best Bar BQ, Bywater Bakery, Bywater American Bistro, Fradys , or Frenchmen Street and listen to some Jazz or Blues music and so much more? Oh yeah, don’t forget to make time for Bourbon Street and the French Quarter. If this sounds like you book your next vacation with Best New Orleans Vacation Rentals Fodor’s names Bywater a top travel destination in 2019 The neighborhood is “full of cultural surprises,” according to its writeup. By Missy Wilkinson@missy_wilkinson Nov 16, 2018, 11:42am CSTSHARE On Fodor’s list of 52 inspiring travel destinations for 2019, New Orleans’ Bywater neighborhood is No. 24, falling between Hawaii and Trinidad and Tobago. It joins international locales including Berlin, Detroit, Morocco’s Atlantic Coast, and Japan’s Setouchi Region. toilet, combination tub/shower, tub, shower, New tub/shower, toilet, and vanity. WASHER AND DRYER PROVIDED. Laundry detergent not provided. A full kitchen, with pots, dishes, utensils, and coffee maker. COURTYARD THAT HAS SEATING FOR 6. Court Yard Patio in rear of property. Great place everything you need. Super great hosts. The house was well stocked and comfortable. The host thought of everything and responded to questions very quickly. Safe neighborhood and quiet. This home is a lovely well maintained home with lots of personal touches. Our hosts were very friendly. The house is a home not just a plain rental. It's comfortable and has everything you need in your home away. The Bywater area is an interesting neighborhood and it looks like homes are being renovated . It's a little sad that an apartment building is being built across the street. Great location in Bywater and property was clean, user friendly and had a nice courtyard. Best place we’ve stayed at on VRBO or Airbnb. Super convenient to Frenchman St and the Quarter. Cathy and Tony were great hosts. Clean, easy but little long walk to french quarter, friendly owners. We enjoyed our stay very comfortable and to experience the city. The place I originally booked canceled on us at the last minute. In my panicked search to find a new place, I stumbled upon this listing. A quick message and call to Cathy calmed me down and I was booked for a stay at her beautiful property. I consider it a very lucky accident that got us here since it turned out to be the best choice for my family. The place is super clean and well stocked with anything you could possibly need. Cathy and Tony are wonderful people and took great care of us. We have family in New Orleans and visit often, we’ve already decided we will only be staying in one of Cathy and Tony’s properties. Thanks, we really enjoyed talking and eating with you and your husband. First time we had a guest ask us to eat. It was an Italian dish and it was delicious it was so good I ask for the recipe. Dawn, her husband and their baby girl were great and I would love to host them again. We are looking forward to their next stay to show them a little of our culture. Oh yeah, and to eat some fresh oyster straight of the boat. The neighborhood is “full of cultural surprises,” according to its writeup. On Fodor’s list of 52 inspiring travel destinations for 2019, New Orleans’ Bywater neighborhood is No. 24, falling between Hawaii and Trinidad and Tobago. It joins international locales including Berlin, Detroit, Morocco’s Atlantic Coast, and Japan’s Setouchi Region. $200 damage deposit is fully refundable if there is no damage and no excessive messiness. This would include issues such as excessive amounts of trash, dishes, laundry in the house. Treat it like your home (not a rockstar hotel room, we do have neighbors) and you will get 100% deposit back. Rates change for special dates, please review. This is a Historical residential neighborhood, so WE CANT ALLOW LOUD PARTIES, sorry. We are strict about 10pm noise rule. Rates are subject to change until reservation is confirmed. No events of any kind that means Reunions, Showers, engagement parties, weddings, etc. Our home is a vacation rental for a nice place to stay while you are in our home. We do not allow any parties, receptions, functions, and anything​ in that order. Sorry, but we are in a Historic Neighborhood, and we must respect our neighbors.